← Signs of Summer 8: Monarchs! It always takes me a long time to notice that something is not where (or when) it should be. I am pretty quick to see new things right when they occur or right when they arrive: the first robin of early spring, the first crocus to flower, the first trill of the spring peepers, the first whirr of the dog-day cicadas, or the first snowflake of winter. But when something that is expected just doesn’t show up it may take weeks for me to note its absence. A great example of this is the indigo buntings that for years have nested along a specific section of the Roaring Run Trail. Four miles up the trail from the main parking lot there is a fork in the Roaring Run path. The right side of the fork goes down a series of switchbacks and then continues for another mile or so to the parking area at Edmund. I seldom ride my bike down these switchbacks because of the necessity to then ride back up them or, if proceeding on to Edmund the need to ride up the long, Edmund hill. I do prefer more level grades for my bike riding and nature watching! The left side of the fork, though, goes off on a flat path for about a hundred yards into the western side of the ravine made by Flat Run creek. The trail stops in a shady turnaround just below the old wooden bridge that used to span Flat Run. You can still see the bridge abutments on either side of the ravine, but the actual crossing span is gone. I remember nervously crossing that bridge years ago on some hikes! It was made up of tarred, heavy, wooden beams. The whole bridge sagged and sighed with each footfall. It is good that that span was removed! There is also, in times of abundant rainfall, a waterfall just north of the turnaround that drops noisily into Flat Run. It is very pleasant to stop and get off your bike when you get to the end of the trail and walk down the short path to look at the rushing water. 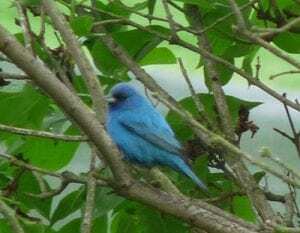 Indigo buntings are small (about five inches long and a half an ounce in weight) members of the cardinal family of song birds. The males are intensely blue and, since they do nothing with regard to nest building, egg brooding, or nestling feeding, they have a great of time and energy to spend their days flying from high perch to high perch singing their territories and watching out for potential nest predators (or passing bicyclists). I have fifteen years of notes on these “Bunting Alley” birds, and was seldom disappointed when I rode my bike down through their territory. 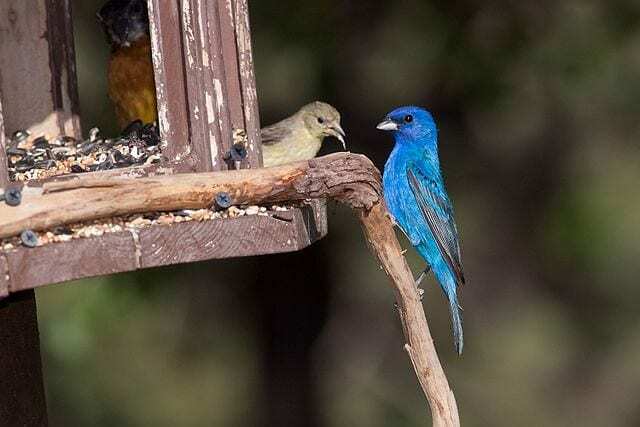 Indigo buntings can have two or even three clutches in a summer season, so the males were present and alert through most of the summer. Last year, though, I saw no indigo buntings here at all, and this year it has taken me until early July to realize that they were not here again! Indigo bunting populations have declined by about a third since the mid-1960’s. Loss of their over-wintering habitats in Mexico and Central America and increased urban and agricultural land use (leading to the clearing of the shrubland in which these birds prefer to nest) may have contributed to this decline. Their nests are also quite heavily parasitized by cow birds which causes considerable loss of bunting eggs and a great reduction in the numbers of their successful fledgings. Interestingly, indigo buntings are classified as “disturbance dependent” birds. Deforestation and abandonment of farms and, possibly, even strip mining which generally lead to increased growth of shrubby habitats tend to favor populations of buntings. 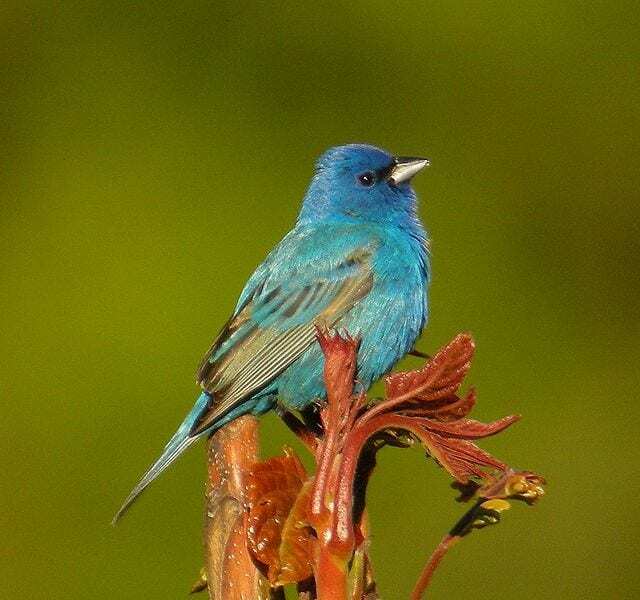 In some places in the eastern United States, indigo buntings may actually be one of the most abundant song birds! In other places, though, they are relatively rare. But, why have they abandoned this stretch of the Roaring Run Trail after all of these years? The surrounding vegetation along this trail has in recent years become increasingly dominated by Japanese knotweed. Possibly the knotweed has filled in the habitat layer that the buntings prefer. Perhaps the knotweed is not suitable for the buntings to nest in (not sturdy enough for an above the ground nest or not dense and concealing enough for an on-the-ground nest?). Perhaps the knotweed does not support the insect and arachnid populations upon which the buntings rely for food. Perhaps the knotweed has excluded the native plants from which buntings gather the seed and fruit components of their diet. Perhaps the surrounding trees (mostly poplars, cherries and maples) have gotten too tall for the buntings to find suitably located crooks for their nests. The site might have aged past its “bunting stage” and has moved on to more mature forest species (like wood thrushes, perhaps?). Whatever the reason, “Bunting Alley” is much too quiet these days. The absence of its neon-blue guard-birds is palpable. I did see a goldfinch this morning and enjoyed his bright yellow flash, but he didn’t glare at me like the buntings used to do. He was much too tolerant and accepting. I have not seen any at all this year. Seeing one is always a joy.